The first statement is especially true in low interest periods like we live in today. As of today a savings account in the Netherlands will barely net you 1% interest on a yearly basis. Even with a very defensive portfolio it should easily be possible to surpass 1%. Of course there is a higher risk of losing money, but the risks are low when sticking to short term AAA bonds and related mutual funds or ETF’s. The second statement is best illustrated with a calculated example. Be aware that for simplicity’s sake all following calculations are made without taking taxes into account. Let’s say 18 year old Pete has a generous grandmother who donates him €5,000. Pete decides to invest this amount into bonds and stocks. His investments gain a modest 5% over the year, which result in a total sum of €5,250. Now, instead of spending the earned €250 he re-invests his earnings the coming year and again gains 5% over his investments. His investments gain €263 instead of €250 (5% of €5,250) and are now worth €5,513 in total. At first the absolute increases by re-investing earnings may seem low, but can grow into a large sum over the years. This is nicely illustrated in figure 1 below. Here, €5,000 is invested at the beginning with a yearly earned interest rate of 5%. In less than 15 years, Pete will have doubled his initial investment. After 30 years of waiting and gaining 5% interest each year, Pete will have transformed €5,000 into €21,610. It gets really interesting when Pete decides to invest additional income each year on top of the initial €5,000. Let’s say granny gets really generous and donates Pete an extra €2,000 a year. Again Pete decides to invest this amount each year and still receives a 5% interest rate over his investments. This situation is illustrated in figure 2. In this case, Pete will have doubled his initial investment in less than 3 years and ends up with more than €150,000 after 30 years. Without the 5% interest rate, it would have been €65,000 instead. The graphs show that the increase is getting steeper the longer Pete waits to spend his invested money. Let it be clear that 5% is a modest interest rate when being an active investor. Maybe Pete is a great investor and can easily maintain a 20% interest rate each year. Considering the initial €5,000 and yearly investments of €2,000, Pete would be a millionaire before he is 42. Try calculating it with one of the many free online compound interest calculators on the internet. 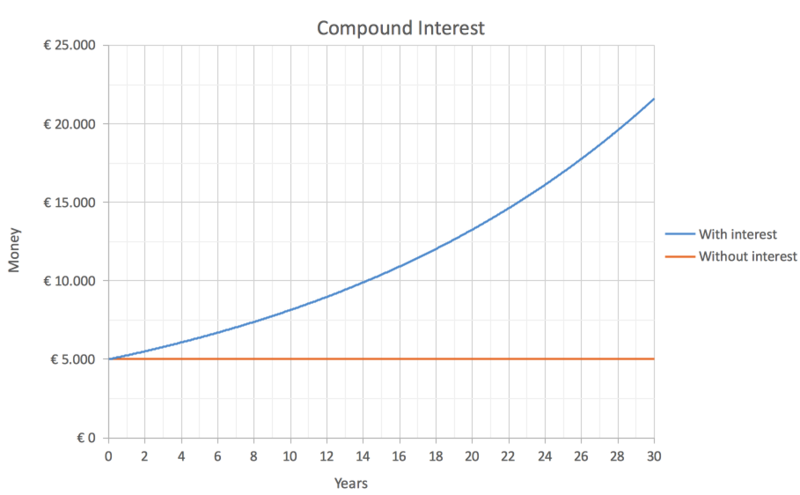 Of course there are two factors that need to be considered when trying to earn a lot of money with compound interest: time and patience. Luckily Pete is only 18, so assuming everything goes according to plan, Pete has all the time in the world to build his fortune before retirement. Other people who started investing at an older age don’t have as much time. The second factor, patience, is also something a lot of people simply do not have. It takes character to be able to wait 30 years and invest periodically in order to gain the sum as illustrated in figure 2. Aside from these factors there is also the added factor that expensive accidents can happen which severely halt the process if the invested money is needed for more important things. 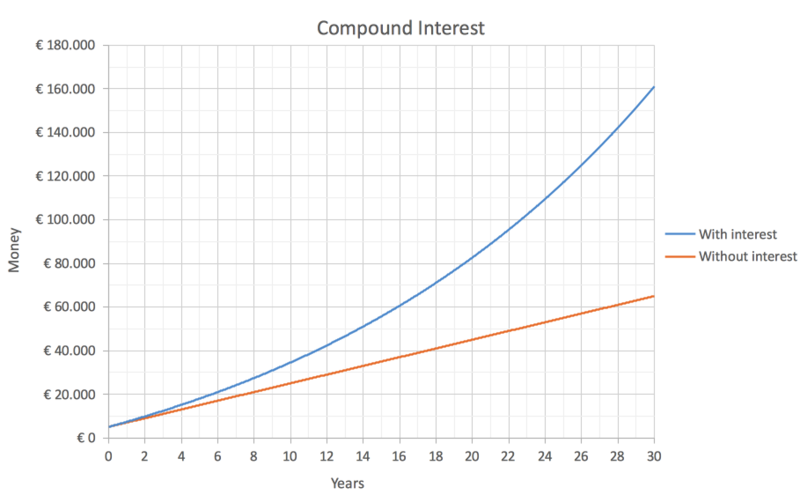 Still, compound interest is a fantastic concept each investor should keep in the back of their mind. Investments made early in life can grow into great fortunes in later life.